Vintage Stitchers met this past week. 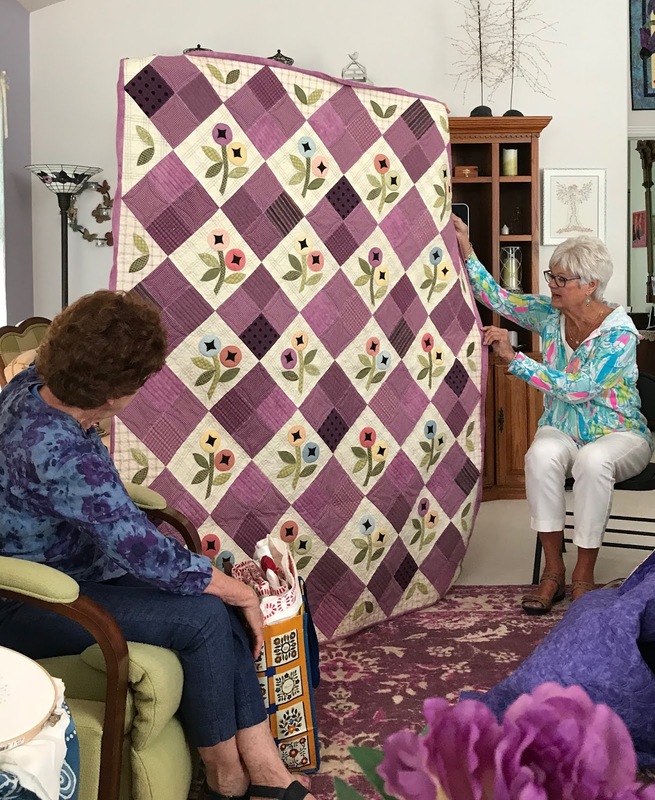 You may remember this quilt of Janet's. 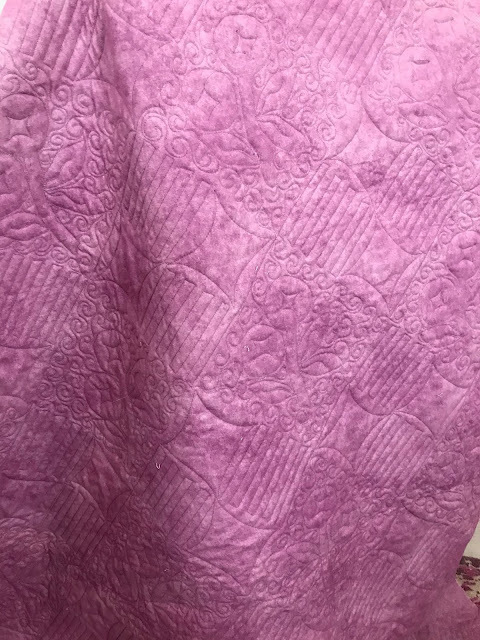 She had custom quilting done on it, and it turned out great. As is often the case, you can see the quilting better on the back. 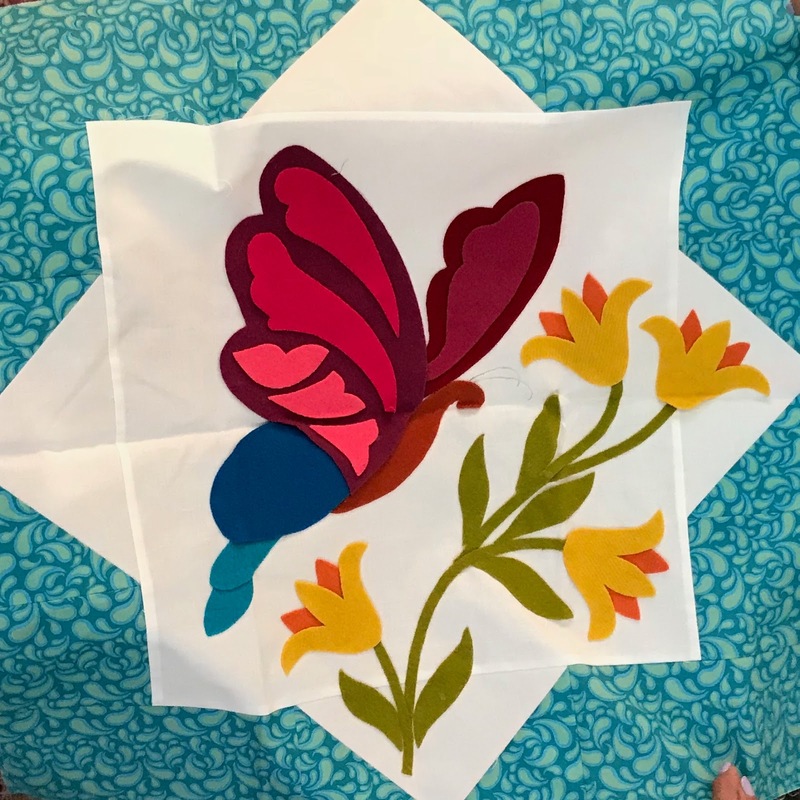 Rebecca has continued to work on her Borboletta BOM quilt blocks. She was working on this one. 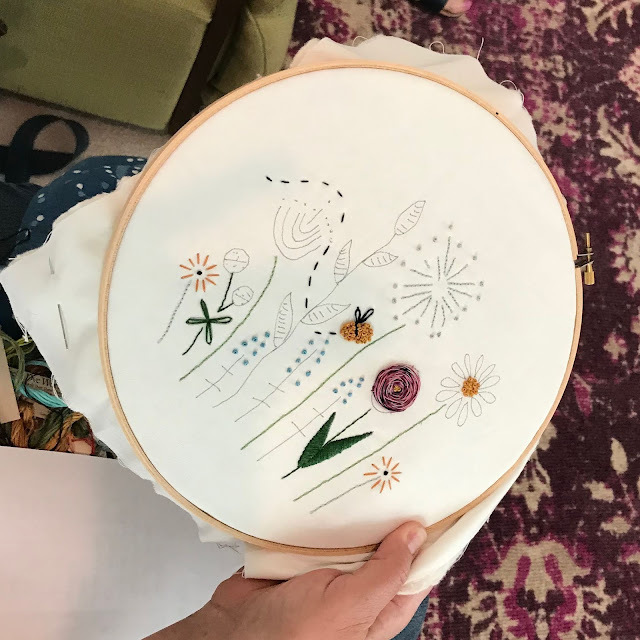 Julie had a new embroidery project. It has batting and backing. We wondered why and decided it was to hide the traveling strands, although we all said we don't travel across the back with their embroidery floss. 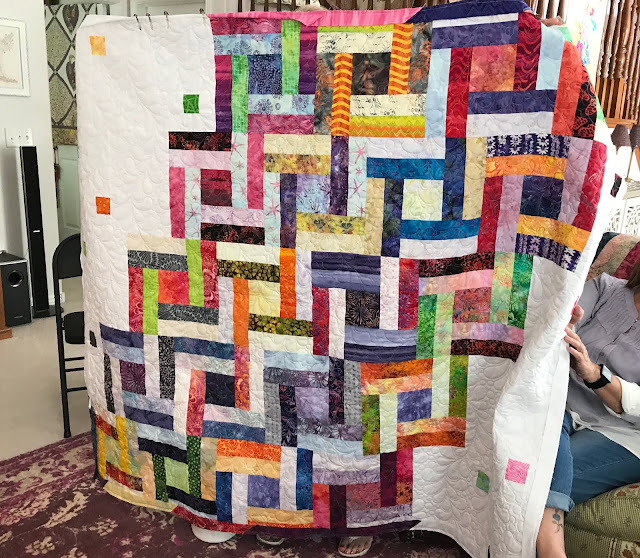 Marilyn had finished this quilt in her usual bright primaries palette. 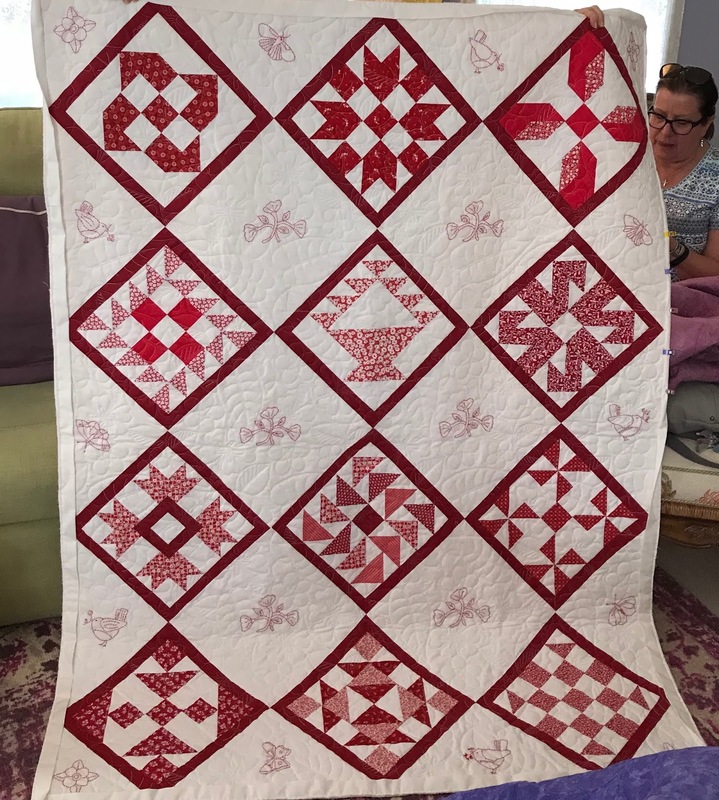 Diane had finished this Redwork quilt. I continued to work on my Spring Flowers quilt. I've been making some progress, between packing and knitting. I packed away my whole cloth quilt, which is perhaps 30% finished. It went into a Chewy (online dog food) box with some other quilts. More on that later. 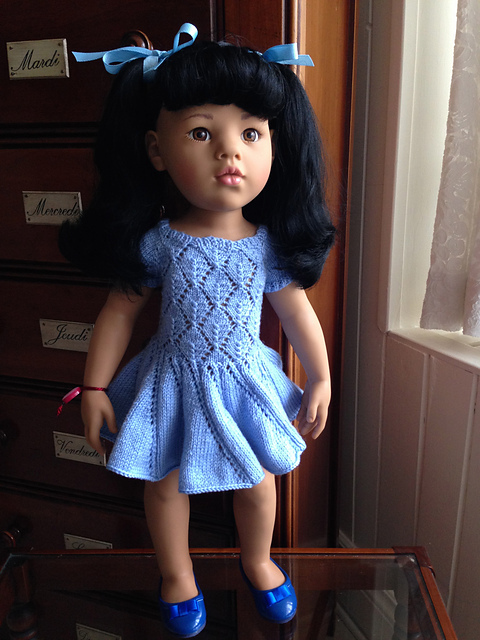 Someone on Ravelry used my pattern to make the dress for one of her dolls, the Asian Hannah. She made hers with the swirled skirt. 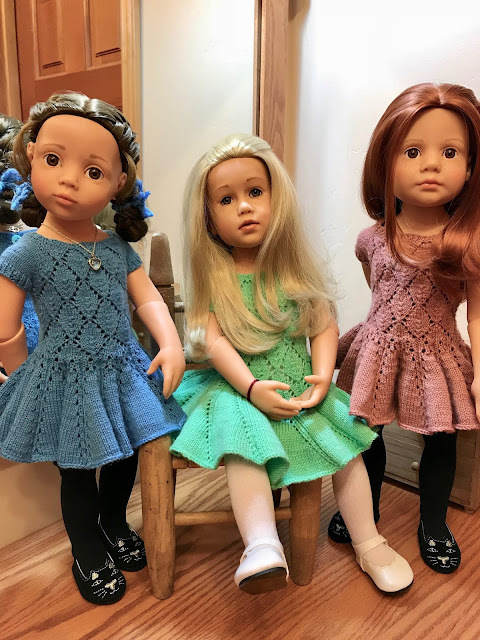 Now all three girls have one of these dresses. I want to make one more for Lotte with the more fitted bodice when I have a chance. 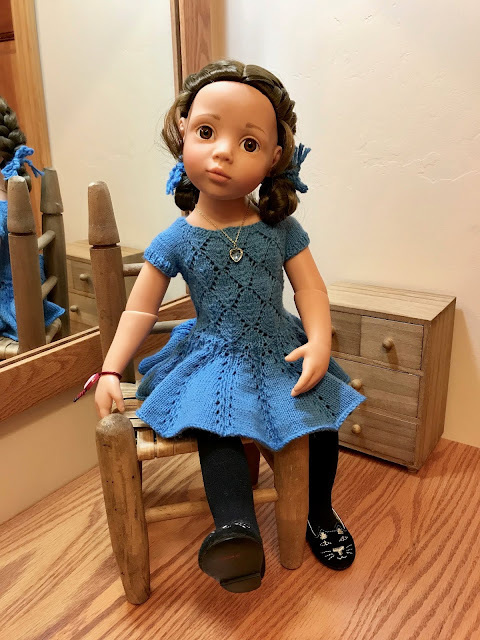 I think her dress will fit Dolly or Gabi, or I could send it to Miss Daphne for her doll. I had planned to take a group photo outdoors, but it turned cold again and rained for several days. Speaking of Dolly and Gabi, they and Alister are on their way to Bend in a climate-controlled vehicle. When they arrive, they will have climate-controlled accommodations until we find a house. 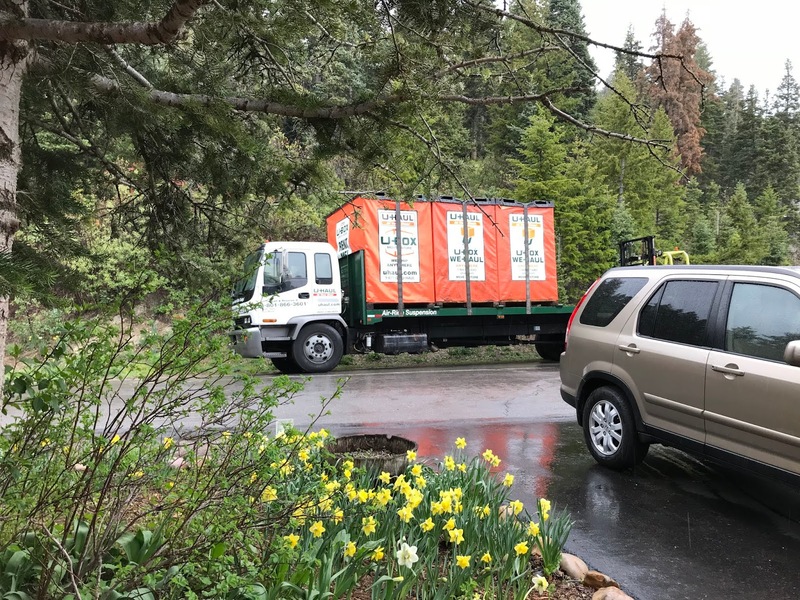 They (and most of our boxes and small stuff) are packed away in large boxes or pods, which were picked up on Friday and taken to Salt Lake City to be loaded into a semi. They should be there in a few days. The Götz girls will go with us. It's Lotte's turn to be the traveling doll, and Vroni and Mandy will sleep in their "coffins" under the bed in the trailer. (They refer to them as "coffins," because they hate the boxes they came in.) Lotte is hoping to pick up more pine cones, ever since I tossed her the tiniest one from our collection, which I was dusting and packing in plastic bags around the girls' dining room chairs. We continue to go through things, doing some finishing up on the downstairs bathroom and getting ready for our garage sale. On Saturday I went to the Acorn Antique Fair in Ogden to collect cards of antique dealers who might be willing to come to look at our stuff. I gave DH a list of what I was willing to part with. He scratched off some things, and we now have a list of furniture and other antique items we agree to part with. Anything the antique dealers don't want will go into the garage sale. 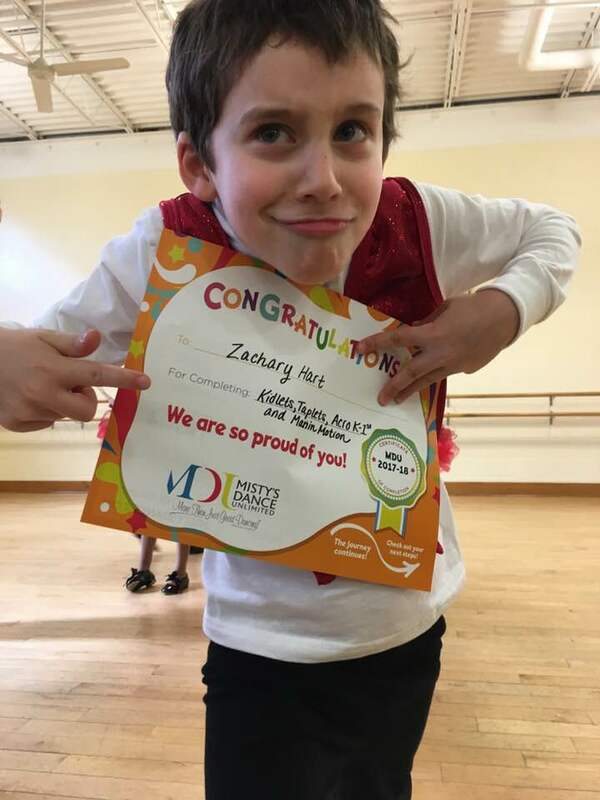 For some cuteness this week, granddaughter Daphne and grandson Zachary completed their year of dance lessons. They tried out for the Alice in Wonderland ballet and were accepted. They will play snails (how do snails dance?) and hedgehogs. It's good to get experience performing in front of a large audience while you're still too young to get nervous. Happy 8th birthday to Miss Daphne today! 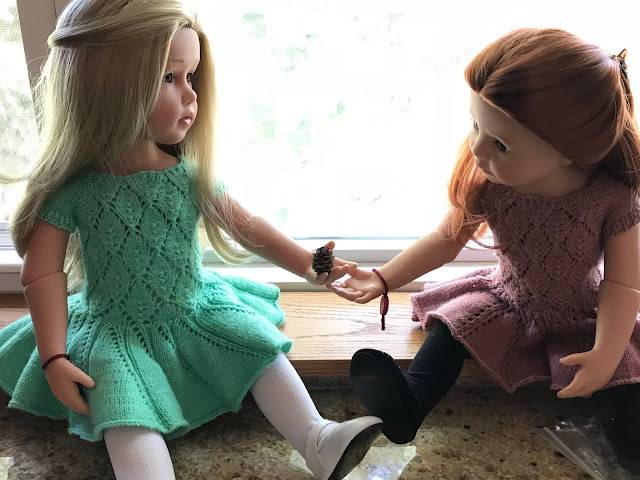 I hope you love your Götz Katie doll! What's on my needles: Still the Coastal Skies, a little more progress made, and the Cabbagetown Jacket for Matti. What's on my Featherweight: On its way to Bend. What's in my hoop: Still the Spring Flowers quilt, coming along slowly. What's on my iPad/iPhone: Still listening to The Young Clementina by D. E. Stevenson. I haven’t had much time to listen this week, but I’ve listened to most of it, and it’s very good. What's in my wine glass: A Trader Joe’s Grower’s Reserve Petite Sirah, 2016. What's my tip of the week: Geranium plants in a box can be pruned and kept for many years. You can bring the box in when the weather is too cold outside and keep them near a window where they can get plenty of light, then take them outdoors when the weather warms up and leave them outside all summer to brighten your porch or patio in a spot with not too much sun. Bring them back in as needed in the fall. We have had ours for about 15 years. We will be leaving them behind, but they are going to a good home. I’m sure they do! I had to translate a knitting pattern from French awhile back. I don’t speak French, but I speak knitting. When I came across jeté I knew it was a YO. The yarn jumps over the needle. Ballet has been useful to me all my life. A great blog as usual. All those beautiful dolls and quilts. As a retired ballet teacher I can tell you about dancing snails. They move slooooowly. I am stressed, but excited, too. Quilting and knitting help a lot. The plum colors in the first quilt are beautiful. How you manage to take pictures, pack, knit, blog, pack some more and still live life is a wonder. Sounds like you are not stressed and hopefully this will be an exciting new chapter in your journey. Quilts are gorgeous. Congrats to your grandkids for being accepted. What a wonderful experience. Yes, the decisions are difficult. There’s an old saying: "Three moves equals a fire." Our moves from one location to another have almost always been paid for. This one's on us. It gives you incentive. If I didn’t have my packrat husband (with whom I’m blessed) I could live in an apartment. "Stuff" weighs you down. A desk is nice, though. The quilts are all so pretty. Lovely work in all of them. The girls sure look nice in their new dresses. It sounds like your coming right along with your move. I think without a doubt moving is one of the hardest jobs around. So much to do and a lot of decisions on what to take and what to leave behind. It was hard on me moving from a big house and into a small apartment and having to give up things I really enjoyed. Like my office desk. I still miss that.